Many companies provide medical billing services, but very few provide true Revenue Cycle Management. 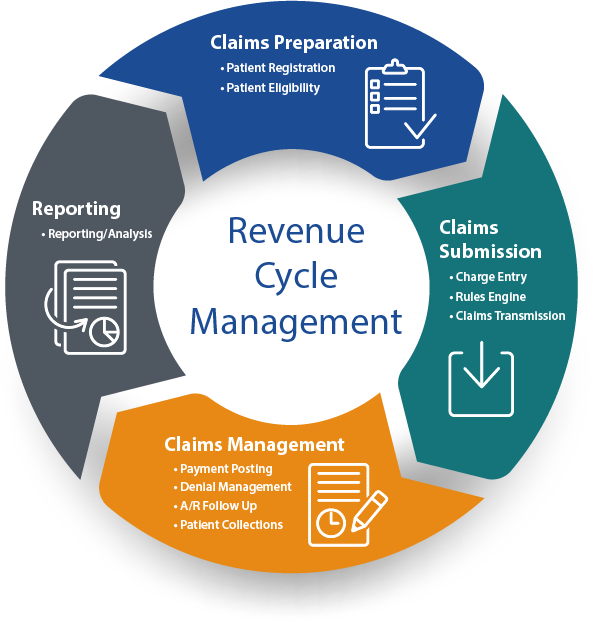 Revenue Cycle Management is the process of managing claims, payments, and revenue generation in order to streamline billing and collection cycles. As a leading provider of Revenue Cycle Management services, Medical Practice Partners proudly helps clients exceed MGMA benchmarks and maximize cash flow. At Medical Practice Partners, we ensure that your front-office staff are well-trained and have the tools necessary to submit claims quickly and accurately to get you paid by the right party as quickly as possible. Each new client has a dedicated onboarding specialist responsible for everything from building optimized scheduling templates to training on how to optimize the Allscripts practice management system. Knowing before the patient arrives what their insurance will and won’t pay for allows you to collect the right self-pay balance amounts up front. We ensure that you are transmitting claims electronically to all possible carriers and are set up to receive ERAs, further reducing turnaround time. At Medical Practice Partners we use a proprietary revenue cycle rules engine that is customized for each client’s needs. The system, called RCxRules, automatically reviews 100 percent of claims and applies an ever-growing list of rules, which are based on our knowledge and experience combined with the latest industry and regulatory guidelines. Click the link below to view a video demonstration describing how we are using RCxRules to process more accurate claims, substantially lowering denial rates and helping our clients get paid faster. While the RCxRules Engine automatically modifies claims based on specific criteria, the Claims Scrubber identifies areas requiring manual review and intervention. The combination of these two tools has dropped our denial rate by over 60 percent, meaning you get paid faster for the work you do. All claims are electronically submitted through a clearinghouse that is connected to hundreds of payers, ensuring accurate and timely delivery of your charges. There’s a reason why Medical Practice Partners’ RCM metrics are so much better than MGMA averages—we diligently track, monitor and work every claim that we’ve submitted. Every billing company claims to work denied claims. We take that a step further by employing an extensive internal auditing staff to make sure that nothing is ever written off (aka “adjusted”) until every possible appeal has been exhausted. The growth of high deductible plans means that your patients—not their insurance companies—are making up an ever increasing portion of your accounts receivable. Starting with the first bill they receive, we employ a 12 step process of gradually increasing aggressiveness to maximize your self-pay collection rate. Medical Practice Partners has a U.S.-based, in-house customer service staff that acts as a liaison between your office, your patients, and the insurance companies. While many billing companies choose to outsource this function overseas, we believe for both security and quality control reasons that it’s better to use Medical Practice Partners’ employees located here in the U.S.
At Medical Practice Partners, we provide you with comprehensive reports that tell you everything you need to know about the state of your accounts receivable and the health of your practice. We like to think of them as the financial equivalent of a patient chart. At Medical Practice Partners, we meet with each of our clients on a quarterly basis to review the latest trends and identify areas of concern or opportunities for incremental improvement. At Medical Practice Partners, we provide recommendations based on the data we review. Remember, we only get paid if you get paid; in other words, our interests are closely aligned with your own. Therefore, we provide the resources that allow you to fully act on these recommendations. Medical Practice Partners takes care of everything that goes into running a successful practice—something I learned nothing about in medical school. With their experience, expertise, one-on-one attention and efficient staff, they allow me to be what I really want to be. Simply, a doctor.